Google’s Chromecast wireless streaming dongles will now support content from the US movie and TV streaming service Hulu Plus. Addition of support for Chromecast brings shows like “Modern Family,” “New Girl” and “Parks and Recreation,” to the big-screen via your smartphone or tablet. As with other Chromcast apps, to view the content on a TV, you simply hit the ‘Cast’ button which is now present in the app. The Hulu Plus Chromecast functionality includes a custom remote control that has all the usual playback controls (for playing, pausing, etc. ), along with a 10 second rewind options as well as the option to enable captions or jump straight to your favorite moment in a TV show. Neat. 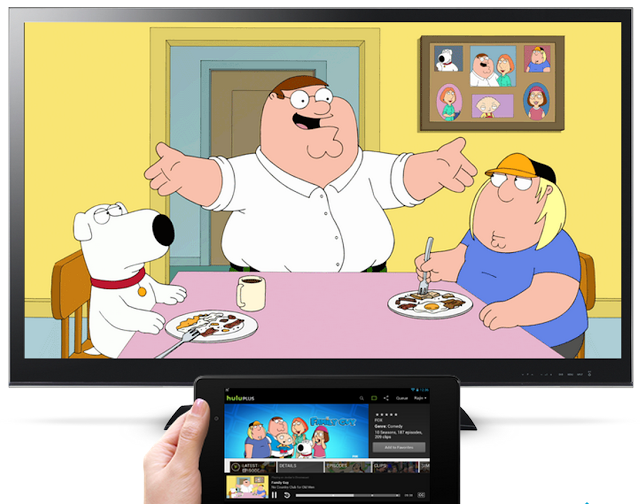 Update: The new Hulu apps with support for Chromecast are now live for iOS and Android.